I hadn’t heard of this book until my cousin asked me if I had read it. Once she asked me, I immediately saw the book everywhere. On the top book club reads list, on Amazons top reading list, everything. It was like a sign to read it. She loaned it to me and I started it immediately. Tara was born and raised in the mountains of Idaho. She and her siblings were educated at home by her mother. I use the term educated loosely. They never went to any formal school. Her parents felt that the education system was a ploy by the government. They never vaccinated their children either. Her fathered live in the world of “everyone is against them and the government is out to get them”. He believed the world was ending on multiple different occasions and started to stockpile food and guns. He also buried massive tanks of gasoline in the ground to help them through the “end of days”. As Tara gets older, she decides that she wants to get an education. She buys books and teaches herself the things that she needs to take the SAT so she can get into BYU just like her brother did. She fails the first time but retakes it and gets a point over what she needs to get into BYU. Through hard work, she gets a scholarship to BYU. For the first time in her life, at the age of 17, she steps into a classroom as a Freshman in college. She takes all sorts of classes and discovers that her father’s rantings were not true. She works hard and gets a BA in History from BYU. When she does that, it opens up a world of possibilities that she didn’t even know existed. I had a hard time writing this review. I loved the book so much but it was hard for me to put words. The author is absolutely amazing. I am in awe of everything that she experienced and she is still so young. She has already accomplished so much. Everything that she went through in the book was astonishing. The abuse that she suffered at the hands of her own brother was hard to believe. As I read the book, I kept having to remind myself that it was a memoir and that it really all happened. I can see why it is making all the top reading lists. I have already recommended it to several people. 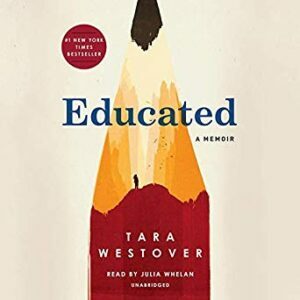 Pick up your copy of Educated by Tara Westover on Amazon, Barnes and Noble, or a bookstore near you. Also make sure to add it to your To Reads list on Goodreads and leave feedback for the author when you are finished. You can learn more about author Tara Westover on her website here.